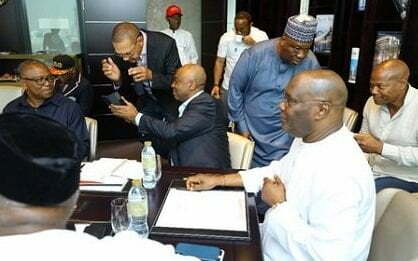 The Dubai meeting had in attendance, Atikuâ€™s running mate, Peter Obi and the Senate President, Bukola Saraki. Reacting, however, the group said the development was a sad reminder of Atikuâ€™s extravagant lifestyle. According to him, â€œEach time Atiku Abubakar considers slinking to Dubai he should be mindful of how the opulence of the desert city warps his sense of proprietary. He has never returned from his Dubai trips lucid enough to accept the reality in Nigeria possibly because his guilty conscience pricks him to know that the PDP could have done better for Nigeria in its 16 years of misrule. â€œThere are various exotic venues in Nigeria that he could have used and have members of his team spend money to boost the local economy but he decided to expend his N20 million annual income in ferrying Peter Obi, Secondus and other clowns in his circus to Dubai for the strategy session. It is therefore not surprising that his team issued the statement castigating the government for planning to use the proceeds of privatization to fund the national budget. â€œThe first thing of note is that Atiku Abubakar, a onetime Vice President (1999 to 2007) and by default the Chairman of the National Economic Council (NEC) at the time, was the originator of privatization or in laymanâ€™s term selling government owned enterprises, businesses and assets. It was under him that the chant of â€œgovernment has no business in businessâ€ or â€œgovernment is incapable of managing businessesâ€ first gained ground and have remained a part of our collective psyche today. â€œThis is why even as the nation continues to explore the diversification of its revenue source under President Muhammadu Buhari, people have been conditioned to the point that no one is thinking of creating enterprises that will address unemployment and revenue sources simultaneously. â€œSecondly, Atiku Abubakar spoke from experience. He is not sure that the national assets in question would be allocated to him and his cronies as it was done under his watch when he held sway over the privatization of most of the countryâ€™s assets. Just yesterday, President Muhammadu Buhariâ€™s Personal Assistant on Social Media, Lauretta Onochie, rubbished the meeting between the Peoples Democratic Party, PDP, Presidential candidate, Atiku Abubakar and his campaign team in Dubai. Nigerians tho.... isn't it his money?